Getting into the spirit of THE wedding, I had the urge to get my new Romantic Roses mini cushion kits made up and put into the webshop. 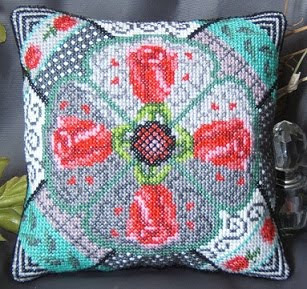 I wanted to create a very timeless mini cushion with this one, and have included the obligatory red roses, with some stylish monochrome patterns which give it a more modern feel but still keeping the romantic theme. I had planned to work on these kits over the weekend so I'm ahead of schedule which is good because I'll now have a bit more time to spend on my papier maché project. I've stuck the maché on and it's drying now, so by the weekend I should be able to start painting the design. I'm going to try to replicate my Orchid Delight mini cushion design on a plate shape. We'll have to see how it turns out though!